The Government, Military and Veterans Affairs Committee discussed a resolution Feb. 1 that would serve as Nebraska’s application for a convention of the states. Introduced by Crete Sen. Laura Ebke, LR6 calls for a convention of the states, authorized under Article V of the U.S. Constitution. Congress would be compelled to call a convention of the states if a two-thirds majority — 34 states — pass identical resolutions. Ebke said the convention’s scope would be limited to proposals imposing fiscal restraints on the federal government, making government smaller and implementing term limits for members of Congress and other elected officials. She said a simulated convention of the states held in 2016 reassured her that a real convention of the states would produce thoughtful, restrained proposals. The convention would deal only with proposed amendments, which would be sent to the states for ratification. It would require a three-fourths majority — 38 states — to ratify an amendment to the U.S. Constitution. Mark Meckler, president of Citizens for Self-Governance, supported the measure, saying the federal government controls 65 percent of each state’s budget, on average. Plattsmouth resident Steve Riese also testified in support of LR6. He said imposing fiscal restraint on the federal government through a balanced budget constitutional amendment is an issue of national security. OpenSky Policy Institute Executive Director Renee Fry opposed the measure. 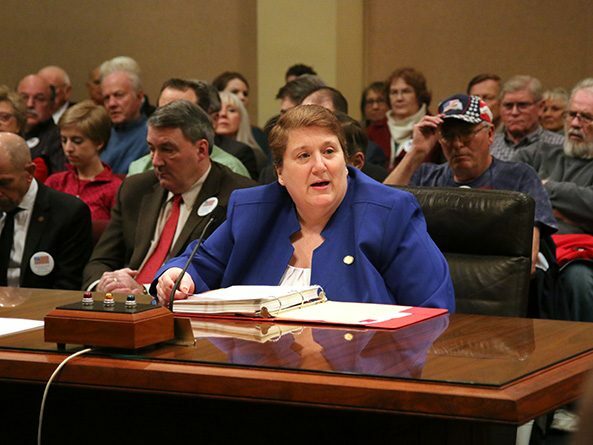 She said federal funds account for nearly 31 percent of the state budget and any limits imposed on that spending could have devastating effects. “LR6’s fiscal restraints could cause incredible damage to our state and national well-being,” Fry said, adding that a loss of federal funding for programs like K-12 education likely would increase property taxes for Nebraska landowners. The committee took no immediate action on the resolution.